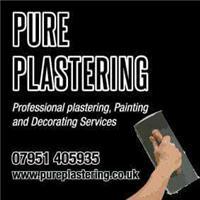 Pure Plastering & Decorating Services - Painter/Decorator, Plasterer based in Taplow, Berkshire. Pure Plastering & Decorating Professional Services – we are who we say we are! Founded in 2002 we are a highly skilled, qualified and experienced team of tradesmen specialising in Plastering & Decorating. We aim to provide a professional, friendly and perfect service whether we are plastering your walls, clearing up or providing you with a quote. We offer a range of high quality Plastering/Decorating services. Painting : All aspects of interior and exterior decorating – Door Stripping and Wall Papering . Plastering : Dry lining – Plastering – Rendering & Skimming. In addition to the standard ‘vetted, monitored and recommended’ requirement, our team are also qualified City & Guilds Plasterers, CSCS Skilled Workers and have passed an approved CITB accredited Health and Safety course. Free no obligation quotes given on all work competitive prices professionally managed and efficient friendly and honest!